In my pledge to put my phone down and read more books this summer, I decided to re-read Daniel Siegel and Tina Payne Bryson’s, The Whole Brain Child, before lending it out to an interested parent over the holidays. This is a book that I have read now 3 times and I’m sure I will be reading it again sometime in the future. The book was originally recommended to me by a school social worker a few years ago and I continue to refer to it regularly even now. 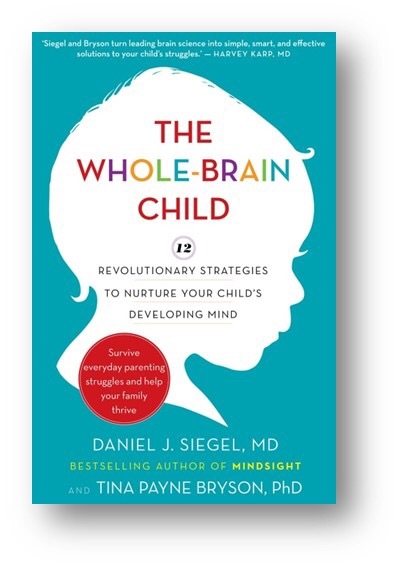 The Whole Brain Child is a book written for parents, but as I’ve mention in prior posts, I find so much of what I learn about parenting, valuable in my role as a teacher, and so much of what I learn about teaching, valuable in my role as a parent. What I took away from the book, I was able to use in both of these roles. Siegel and Bryson’s book provides pretty much what it’s subtitle states, 12 Revolutionary Strategies to Nurture Your Child’s Developing Mind. The premise is that these 12 scientifically based strategies will help to integrate the different regions of the child’s brain (left and right brain, and upstairs and downstairs brain) in order to optimize mental health and brain development. There is no magic behind the strategies and they are not foolproof; they are meant to be shared and practiced regularly with your child in order to help you and them gain a better understanding of the brain and greater control over their own emotions. What I like most about the book is Siegel and Bryson’s way of putting the complex science behind each of these 12 strategies into layman’s terms. They use a lot of analogies, which is how I tend to remember things best, so the explanations worked really well for me. They also provide real life examples, kid friendly explanations and a fridge cheat sheet for parents, for each of the strategies, all of which have proven very useful. If you are a teacher, child care provider or parent to young children, I highly recommend this book. By understanding how the brain works, you will more easily be able to navigate tough moments with your child, as well as better equip them to understand and manage their big emotions. For an example of how I have used information from the book with my students and children read more here.